As THE title of 2011, my expectations for this one were sky high. While Shatter Me didn't exactly meet my expectations, it made a thrilling and exciting debut novel that I enjoyed a lot. Mafi's writing is beautiful and she manages to create a terrifying, yet believable dystopian society with her beautiful prose. Juliette has been locked away for 264 days, but despite her isolation, she is remarkably clear minded. I love how the writing pulled me into Juliette's experience in the entire novel. While I thought the blurb 'The Hunger Games meets X-men' was a bit overdone beforehand, that's exactly fitting for the book. The combination of dystopian and paranormal powers, together with Mafi's lyrical prose, makes for an incredible journey while you're sucked into Juliette's story. I found myself wanting more, reading more, flipping another page when I should have done other things. Overall, I'd say that this is a great book. The only reason that it didn't get the full five stars from me is that it didn't meet my expectations, but admittedly, those were ridiculously high. 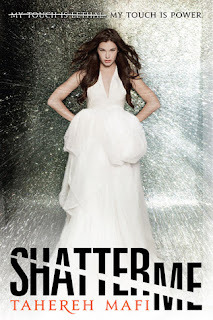 I'm axiously anticipating book 2 because I want more, more more..
Well, I liked Shatter Me cause I do think it's a great book with a great story, but I just gave it 3 out of 5 stars, because, I think, my expectations were absolutely high. For me, the first half of the book was really slow. I mean, I did understood what Julliete was going through (well, at least I tried). And then I really liked the other half, and this is why I am really looking forward to reading Unravel Me.